We are one more important step forward to securing a green future for the Green Gap. The Honourable Justice Dove of the High Court has refused Grainger’s request for a Judicial Review of the case. The judgement notice unequivocally supports the Inspector’s reasoning, and it trashes Grainger’s spurious claims of illegality. This entry was posted in Uncategorised on 8th July 2017 by Mind the Green Gap. 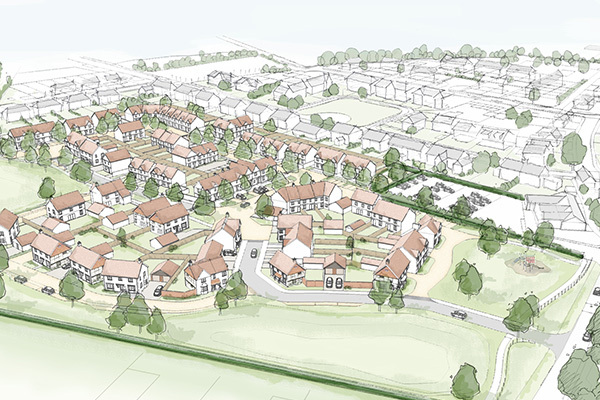 Catesby Estates has made an outline planning application. They propose a 135 unit estate on a field East of Park Road. The field is in East Hagbourne Parish on the Didcot Town boundary. As there are multiple speculators in our midst you may be confused what’s (not) planned where. To help you out there’s an map here. This entry was posted in Uncategorised on 21st June 2017 by Mind the Green Gap. MIND THE OTHER GREEN GAP? We’re not anti-housing. But we are pro-plan and here’s another development of some concern. Catesby Estates Ltd. is promoting a scheme in East Hagbourne. It is on the east side of Park Road, south of the Didcot / East Hagbourne Parish boundary (see the location in Google maps). Presently the distinctive ridge and furrow field is sheep grazing pasture. In the future it could be a 135 unit estate. And an estate with a road layout that facilitates further development in adjacent fields. 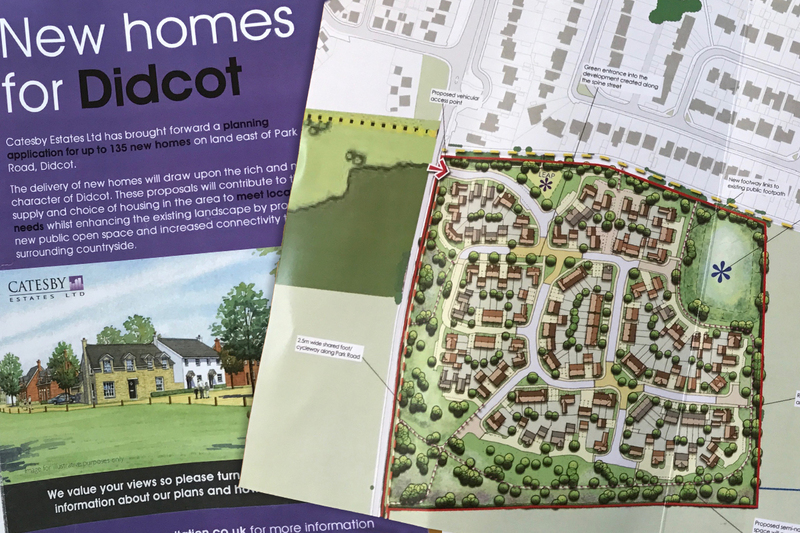 The developer has leafletted houses in Didcot and launched a consultation website. You'll find a Design and Access Statement on the site which provides some detail into their proposal. They claim to have already lodged an application with SODC, although non appears to be on SODC’s planning portal. Catesby are not builders and we assume they are promoting the scheme on behalf of a landowner. Catesby seeks to interact with local communities as soon as possible within the planning process. Catesby holds meetings, workshops, events and exhibitions with key stakeholders and the public and acknowledges the significant role that they play within the planning process. Yeah right. Catesby are cynically ignoring the development’s location in East Hagbourne Parish. While folk in East Hagbourne have been ignored they’re entirely free to join their neighbours in Didcot in letting Catesby know what they think. You can do this using the link below. And once the planning application is live you'll be able to tell SODC what you think too. This entry was posted in Uncategorised on 4th June 2017 by Mind the Green Gap. WILL THIS BE A HIGH COURT DRAMA? We’ve previously said that MtGG will only be involved in Grainger’s court action in the background. This has proved to be only partially true. 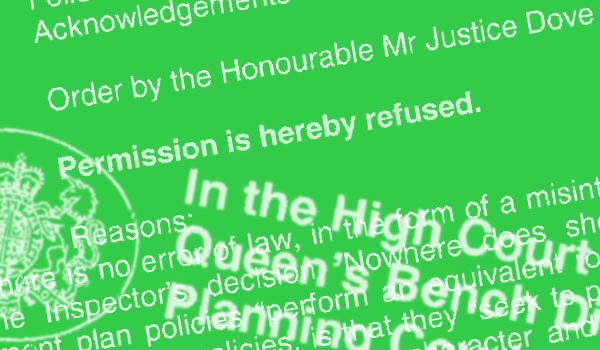 Today we sent an ‘Acknowledgement of Service’ to the High Court. This informs the court that we are an interested party that has a view on matters. The Acknowledgement of Service is an opportunity for us to set out clearly how Grainger’s claims of legal error are unfounded. With the help of our lawyers and the support of the Parish Council we’ve been able to explain how their case is as spurious as the inspector’s judgement is sound. This step, you’ll be glad to know, does not commit us to any expensive on-going involvement in court proceedings. Not that we should worry too much. One would hope Grainger’s ridiculous attempt to void fair process will fall at the first hurdle and be thrown out before it gets to a full hearing. This entry was posted in Uncategorised on 25th May 2017 by Mind the Green Gap. We have another developer keen to build in East Hagbourne. Leaflets were delivered today by Greenlight Developments concerning a Public Consultation into a 74 unit development on the field surrounding Hagbourne Village Hall. Greenlight have asked SODC for an opinion regarding a Environmental Impact Assessment. This is an uncontentious technical exercise but a precursor to a formal outline planning application. We have carefully considered how the Campaign should react to Greenlight. There’s is a clue in the name: Mind the Green Gap. We are a “single issue” group. We took our remit from the local community when it came together in the Village Hall on that fateful evening in 2015. 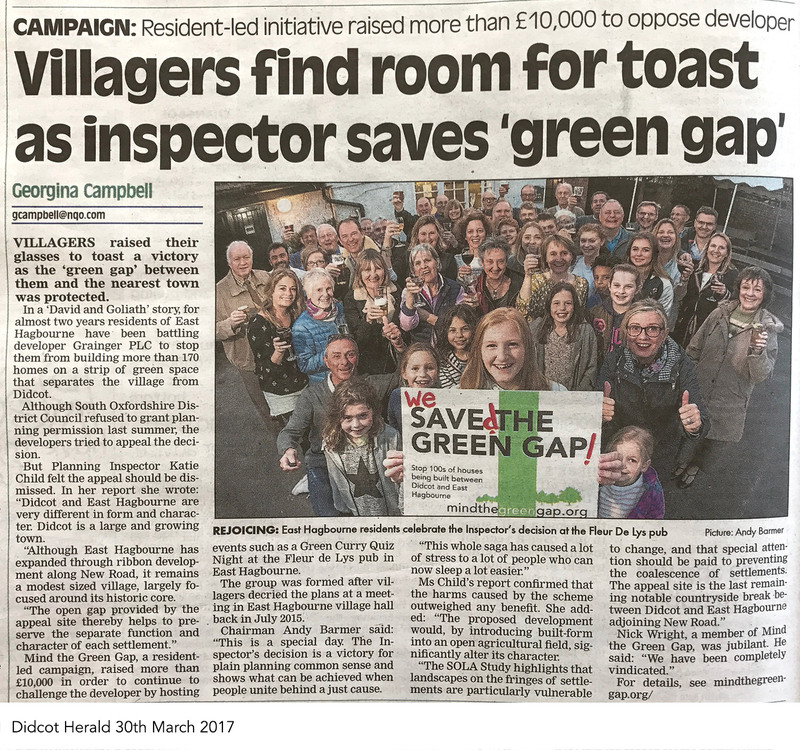 A remit to save the green gap that protects Didcot and East Hagbourne from coalescence. Our single issue campaign was also a time buying exercise. We needed to fight off this attack whilst the community achieved more control over development in the parish through a Neighbourhood Plan. MtGG’s view is that we should focus all efforts on getting the Neighbourhood Plan ‘made’ as quickly as possible. Most of the MtGG committee are part of the Plan team. Our efforts, and those of all Plan team members, are focussed on completing a plan that has teeth. We know that there are other Developers about to break cover. We are still fighting a battle (vs. Grainger), but concentrating on winning the war (via the NP). It is only by winning the war that we can hope to be successful in winning individual battles. Meanwhile ... East Hagbourne Parish Council are carefully monitoring the Greenlight situation and they’ll most likely respond to the consultation. You may want to do the same. Remember that developers are obliged to take note of the results of community engagement. Have your say. So, while MtGG will not be the leading the charge we're here to help. We're keen to share our experience and insight if we're called upon to do so. Grainger has made its move. One day before the deadline is up it has launched a legal challenge against the appeal verdict. Grainger’s options are limited. It cannot ask for a ’second opinion’ on the substance of the decision – it can only challenge the lawfulness of the process. It has sent an initial ‘Statement of Facts and Common Grounds’ to the High Court of Justice (you can see it here). In due course there is likely to be a court hearing where a judge will perform a Judicial Review and rule on the matters of law. None of these are a silver bullet for Grainger. The Inspector’s decision was sound and rational and Grainger faces an uphill battle in persuading a judge that the nuanced legal technicalities it sites undermine this fact. Why have Grainger done this? You may agree that Grainger’s move is cynical in the extreme. It is happy to ignore the view of our local politicians; the view of our Parish, Town and District councils; the view of the Planning Committee; the view of the Inspector; and the view of hundreds of concerned residents. This cynicism is born of the huge profit it seeks to make. It has spent hundreds of thousands of pounds so far – but what’s a couple of hundred more when there are millions to make. And to add insult to injury should they win the judicial review it’s us residents, as tax payers, that will foot the bill and pay Grainger’s costs. Grainger are motivated too by the prevailing winds of changing policy. SODC’s new Local Plan is reaching maturity; Didcot Garden Town’s plan’s are evolving; and The East Hagbourne Neighbourhood Plan is drafted. None of this is good news for Grainger. They’re making a bolt for the door before it shuts. Assuming that the Secretary of State decides to defend their inspector (we presume they will) the case should get to an initial hearing in the next 1-2 months (the forthcoming General Election may lengthen this time). If the Court thinks it is a worthless claim it will be kicked out immediately. If the initial hearing indicates that there are proper grounds to the challenge then it should get a full hearing 3-4 months after the initial hearing. The decision emerges 1-2 months after that. What can we do as a campaign? Mind the Green Gap have not been cited as a defendant (which is probably good news). So, our input will be in the background rather than centre stage. We have sought legal advice and will provide help and support wherever it is needed. We are not yet sure how individuals can participate in proceedings (as soon as we know so will you). We do know for sure that whatever the outcome of this process it is vital that a strong and well supported East Hagbourne Neighbourhood Plan is in place as soon as possible. The Steering Group have been working hard on drafting the plan. You can hear how its progressed and show your support at a meeting at 7.30pm on 18th May at the Pavilion. 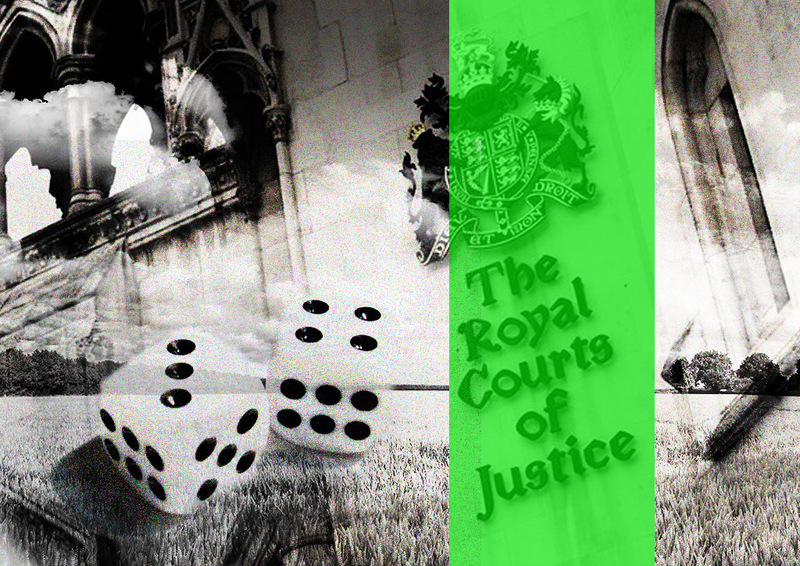 Even if a judge rules in Grainger's favour they cannot then order in the bulldozers. Instead the whole process will re-set – perhaps to the beginning where a fresh development application will be made. This is our understanding to date. If we get advice that is contrary to this we’ll let you know. Grainger has appealed to the High Court so any further legal action should it lose the case is very unlikely. Grainger’s last chance will be up. Its last role of the dice will be zero. 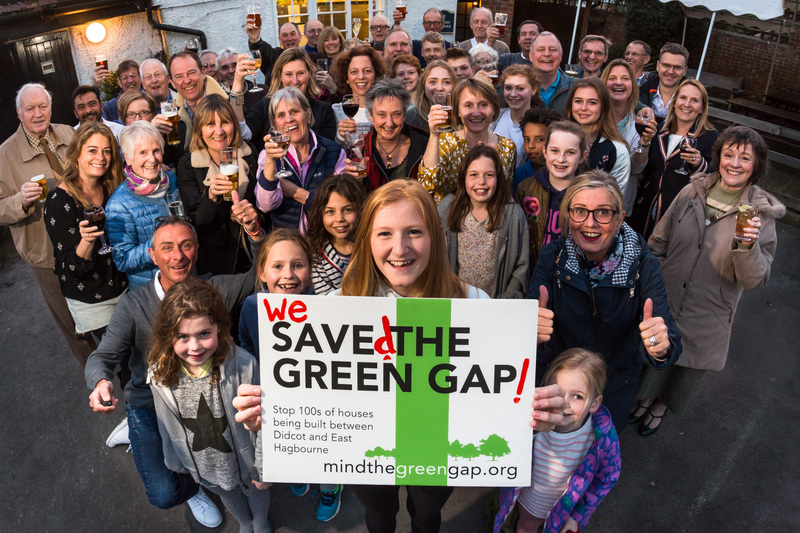 The Green Gap will be saved! This entry was posted in Uncategorised on 4th May 2017 by Mind the Green Gap. Residents celebrate at the Fleur de Lys, Sunday 26th March. It's great to read some good news in the paper. 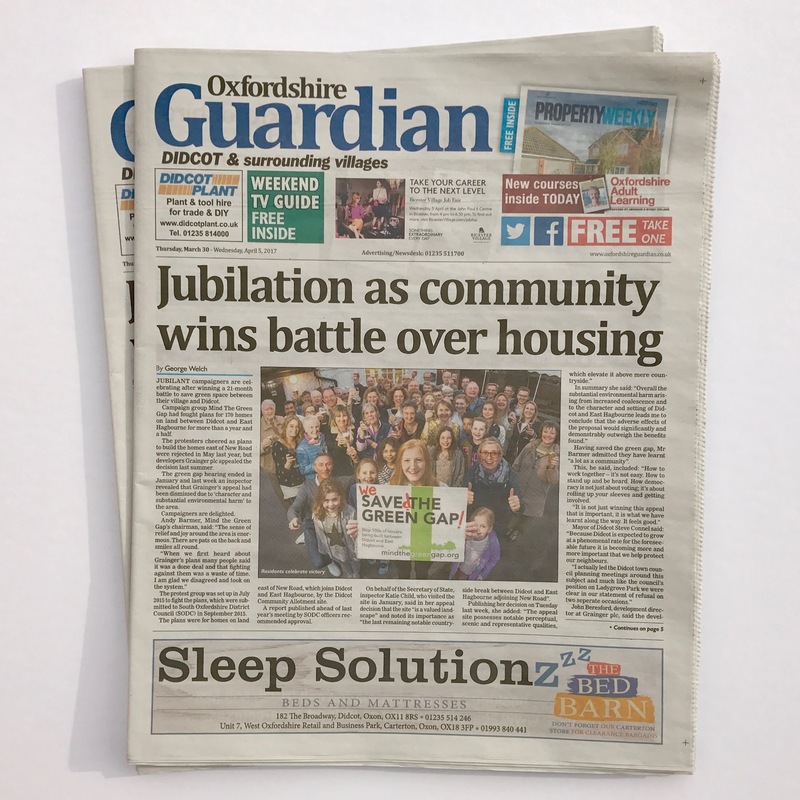 The Didcot Herald ran the story, and we were front page in the Oxfordshire Guardian (it's on their website too). In the Guardian we hear from Grainger's John Beresford. He reminds us that "The pressures of delivering housing to meet both demand and housing need were not disputed by any party at the appeal". That's quite right John. We're not against housing, we're against unwanted opportunistic development in unsustainable locations. We also hear that Grainger will "review and reflect on the decision before discussing with our advisors.” Our advice is to give up with this scheme. It's simply in the wrong place. Whatever happens we'd like to raise a toast of thanks to Mr Beresford and his colleagues. We've learnt a lot as a group and community over these last months. We've learnt that if we pull together, hard work and keep focused we can make a difference. This entry was posted in Uncategorised on 30th March 2017 by Mind the Green Gap. The democratic decision of SODC’s planning committee has been upheld. The informed view of town and village residents has been endorsed. Grainger’s machine has been halted in it’s tracks. The inspector has made her decision: ‘The Appeal is dismissed’. 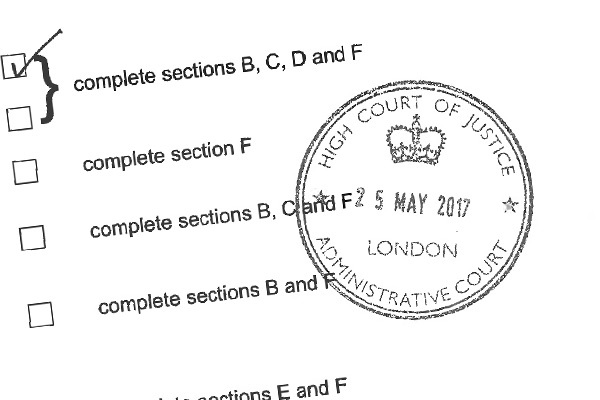 Ms Katie Child’s Appeal Decision is a great read (you can see it here). She has taken a sensible pragmatic view; informed not just by argument presented at the appeal but by going to see the place for herself. She “consider[s] that the appeal site possesses notable perceptual, scenic and representative qualities, which elevate it above mere countryside.” She thinks it “is a valued landscape” and notes the critical importance of it as “the last remaining notable countryside break between Didcot and East Hagbourne adjoining New Road”. Well said Ms Child! We could not agree more. Sadly Grainger is not likely to walk away. It could submit a revised proposal – perhaps of a smaller scale (although that scale would need to be significantly different to not fall round of the fundamental reasons for the appeal refusal). Or more likely it may throw more of its money at a legal challenge to the decision. To be successful they would need to persuaded a judge that the decision falls foul of law. This is not an easy task but a route it may well take. A ‘Judicial Review’ of this kind must be lodged within six weeks of the appeal decision. This is a significant victory for common sense. 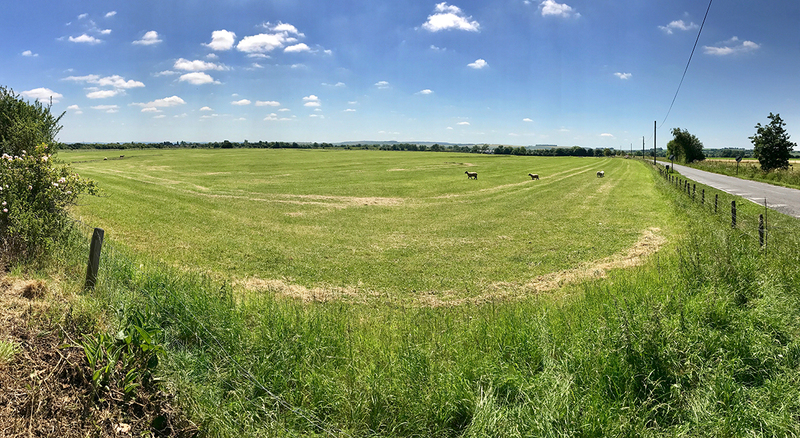 And most importantly it is bad news for other developers planning similar speculative schemes on the environs of Didcot – most notably Nurton’s aspirations to build out on the land to the south of the Green Gap. To Nurton Grainger’s ‘Trojan Horse’ must look more like a lame duck right now! With East Hagbourne’s Neighbourhood Plan gaining serious momentum, and the positive precedent of this decision, we can hope our power as a community to deliver housing that’s fit for need, not just fit for developer's profit, is much enhanced. Did we do the right thing in spending our hard earned money becoming a rule six party to the appeal? Given Ms Child agreed with out core argument we think we did. And we think it’s given us a great name for knee’s up. We’re planning a celebration in the very near future – The Rule Six Party should be quite a hoot. Watch this space. Well done everybody. In her notice Ms Child is careful to point out that she’s not been swayed by the crowd. But she does go out of her way to note “the significant level of objections to the appeal scheme and the high level of attendance at the inquiry”. You had your say. And you were heard. Congratulations. 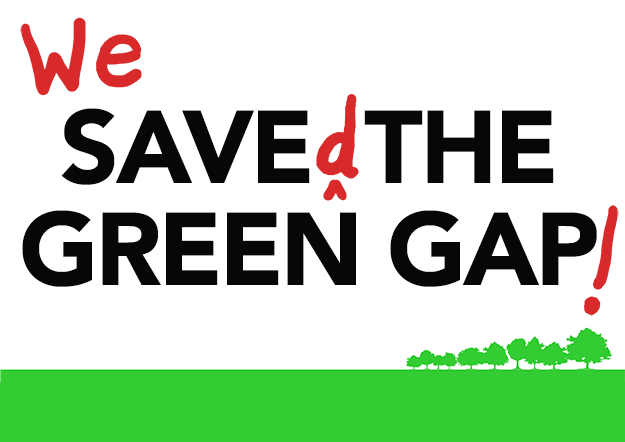 You saved the Green Gap. This entry was posted in Uncategorised on 22nd March 2017 by Mind the Green Gap.